The Office of Financial Aid helps facilitate Illinois Tech's campus Federal Work-Study (FWS) program. Available FWS positions and other campus employment opportunities are listed on Handshake. Interested students with a FWS award should visit the Student Employment Office website for required employment documentation. Students selected for any on-campus position should submit all employment documentation to the Student Employment Office. If you secure a Federal Work-Study position you will be paid bi-weekly by your employer. If you plan to use this funding to pay your account balance, we suggest signing up for a payment plan with the Office of Student Accounting in order to avoid late fees. FWS is an employment program for domestic undergraduate and graduate students. The program requires students to earn their award through on-campus employment. A FWS award does not guarantee funds as it is the responsibility of the student to find on-campus employment. FWS is awarded to students by Illinois Tech based on demonstrated financial need as determined by the FAFSA. Funds are limited and are awarded on a first-come, first-served basis. Questions regarding eligibility can be referred to the Student Employment Office. A FWS award authorizes a student to participate in the program and sets a limit as to the amount of income a student can earn during the academic year. It is the responsibility of the student to find on-campus employment and work enough hours to reach the earnings limit. After a student earns the full FWS award, the student's employment ends, unless the Illinois Tech department employer offers to pay the student employee's wages from the department's budget account. To find and apply for a position, please visit the Handshake portal. 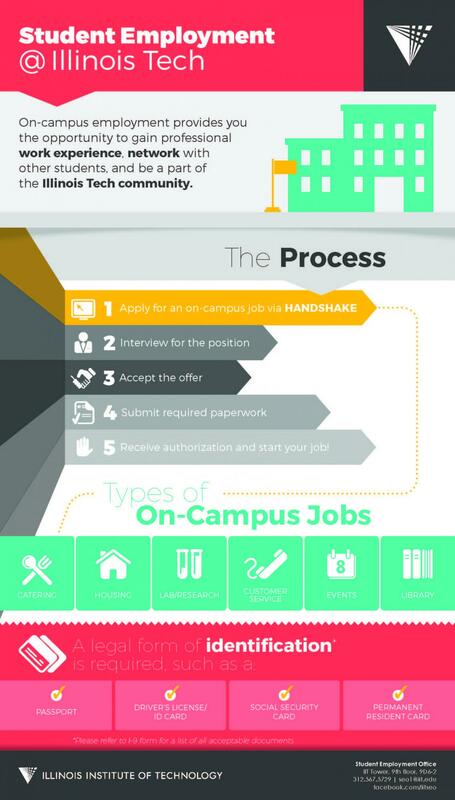 For more information regarding working on campus, requirements and types of jobs available, see the infograph below. Students who are eligible to participate in the Federal Work-Study (FWS) program can choose to utilize their FWS funds to perform community service. Community service is defined by the Department of Education as services that are identified by an institution of higher education with local nonprofit, government, and community-based organizations, designed to improve the quality of life for community residents, particularly low-income individuals, or to solve particular problems related to their needs. Funding for these positions is limited. To view all available community service positions, please visit the Handshake portal.